The Milani kouros in Florence is undoubtedly real. 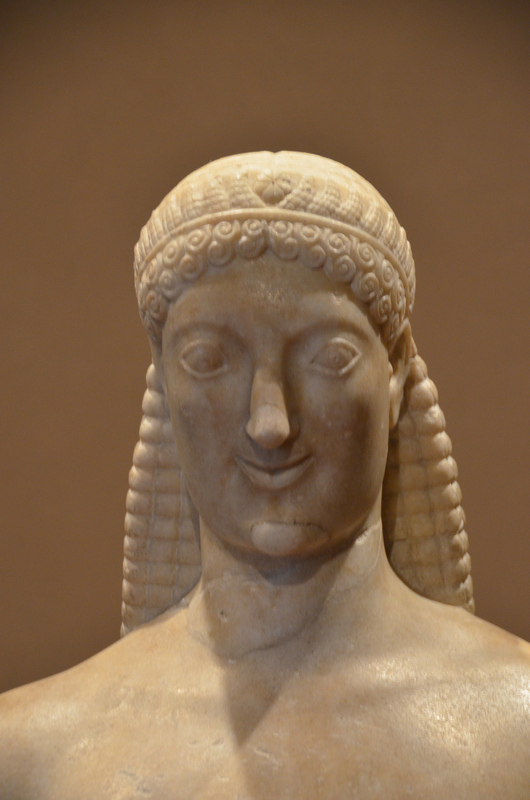 I doubt any modern forger would dare to produce a kouros with such a goofy yet charming Archaic smile. He looks better when seen from slightly below, which makes me wonder if he was originally displayed on a high base or pillar. Milani kouros, photo by Richard Mortel. Florence Archaeological Museum. 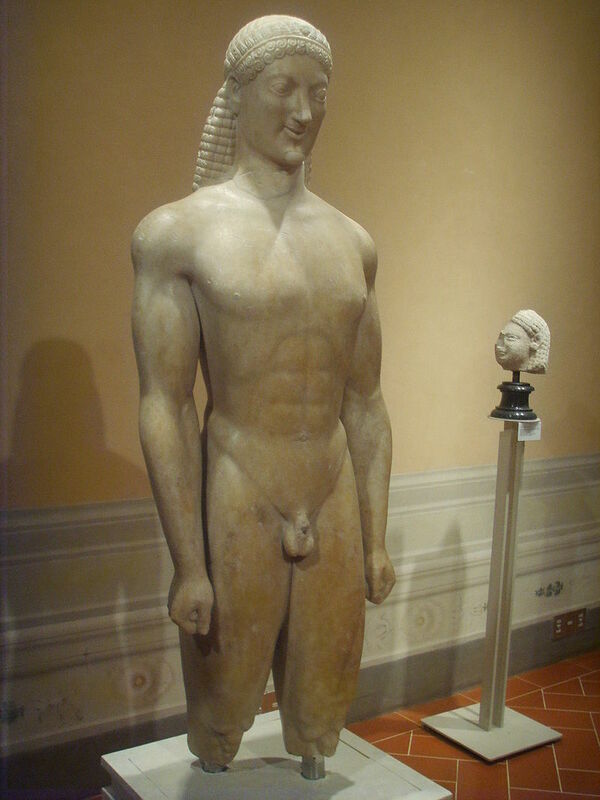 The Milani kouros has a lovely trim-waisted body with powerful arm muscles and prominent pectorals. The Milani kouros (ca. 550 BCE). Wikimedia Commons, photo by Sailko. “You’re probably wondering why I asked you to lunch,” said Jeffrey Toobin. He and Andy were sitting in Cooper’s Cavern, a favorite hangout for the Philadelphia legal crowd. It was one of those restaurants that mimicked a hunting lodge, with lots of dark wood paneling, rare steaks, and expensive Cabernets. The atmosphere was decidedly masculine. Not what she would have chosen, but Jeffrey was treating. “I assume it’s something to do with John,” she said, and he nodded gravely. “Yes, though I also wanted to catch up with you. I like to meet with each of my clients every other year or so.” Ah. He writes these lunches off his taxes. They continued eating their steaks. Andy was enjoying hers. She liked them rare, as a matter of fact. John disliked steak and said it made him dyspeptic. She hadn’t tasted a New York strip in years. “John died when you were forty-one. He left instructions that if you were still… unattached four years after his death, I was to give you this.” He held out a manila envelope. I write this to assuage some of the guilt I feel at having selfishly but inevitably left you in middle age without a partner. No woman could have been a more devoted wife and lover than you. If you are reading this, it means you’re still moping about. 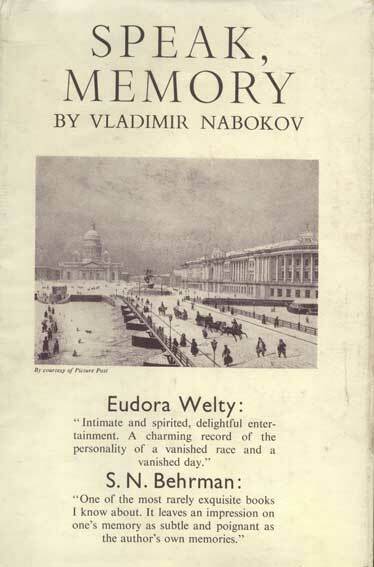 As an appreciative reader of Nabokov, you know very well that Memory did not hold him back. Mnemosyne —that comforting Titaness— was the dynamo that moved him forward and stoked his creativity. Don’t allow yourself to be held back. If I know you, you’ve turned my study into a moldering shrine, like that grim mausoleum of Freud’s, with every book and tchotchke in its original place. Go home right now and clean it out. Sort through my desk, and my files. Keep anything you want, but make the space your own. Perhaps you’ve avoided this task for fear of the pain it will cause you. Remember, I performed a similar task after Edith died, though it took me a few years to get around to it. If I could do it, so can you. The letter was laid inside a copy of Vladimir Nabokov’s memoir Speak, Memory— a first edition from 1951, she noticed with shock. John, who was frugal by nature, had spent lavishly on this gift. She wondered what his instructions had been in the event that she was remarried by now. Would the precious book have become the property of Jeffrey? Or would Jeffrey have presented it to her as a wedding gift, sans letter, with some casual remark that John had always commented on her love for Nabokov? The book was tied with a length of red silky ribbon, slightly faded, and she choked up as she touched it. Probably that spool, with whatever remained of the ribbon, had been sitting in his desk since before she married him. It was time to do some housecleaning. If I had to choose a metaphor, I would say that John was more my sculptor than my father-figure. I was Galatea to his Pygmalion. He directed my career, decided which fellowships I should apply for, who should write my recommendation letters, which jobs were worth having, which papers I should present at conferences. He urged me to get excavation experience, and accompanied me to the digs, living in whatever rooms were available nearby, but insisting that I share the same accommodations as my fellows, so as not to disturb the camaraderie. He drew the line, however, at tolerating the rather indiscriminate and casual sexual couplings that go on among the younger staff on digs. I well remember him sitting in the shade with a bottle of retsina, his Panama hat lying next to him on the sand, watching me frolic in the surf with the other young puppies. That night he took me back to his room. It was John who decided that, in the fullness of time, I should apply for the ancient art history position at Parnell State. Although it was not a first-rate school, he said, it was close to Philadelphia with its Institute of Fine Art, where a first-rate collection of ancient objects was kept, and where the curators were aging and would eventually need to be replaced. Then too, my mother lived in the area, having now retired from Temple, and John placed great weight on filial responsibility. So it came to be. I took the job at Parnell, and five years later, I accepted a concurrent appointment as Curator of Greek Art at the Institute. John and my mother were close in age, and it was disorienting to see them together. At their first meeting, Margaret expounded to a bemused John her theory that the earth would be much better off if only a few males were permitted to exist, for purposes of reproduction. Communities would be ruled by groups of elder women, and the world population would remain limited enough not to threaten human survival. Adult men would be kept in seclusion except when required for stud purposes. There would not be enough men to make wars possible, and violent crime would be nearly unknown. The elders would decide who got to mate based on the talents they wished to perpetuate in the community. “Mother hates phenomenology,” I explained. I started this journal entry by saying that I never thought of John as my “father figure” during our marriage. He was my husband, my intellectual and sexual partner. And yet, since his death, I am plagued by recurrent nightmares that John was my father in the most literal sense, that somehow he was the unknown stranger who impregnated my mother that fateful day, and that I married him like some female Oedipus, heedless of her true identity. In the cold light of day my fear seems ridiculous, of course. John and my mother only came to know each other once we moved to Parnell. They gave no sign of any prior acquaintance. And yet, I would tell myself in the depths of the night, why would they? Two people so steeped in classical literature surely would have realized that they must avoid, through utter and absolute denial, the recognition scene that leads to doom foretold by the gods. Notes: I get a kick out of Margaret, Andy’s antisocial, eccentric mother who believes that the world would be much better off if it were ruled by women (ones like herself, naturally). And yes, I had my little joke about phenomenology, that notoriously difficult-to-grasp branch of continental philosophy, and its founder Husserl. Being highly introverted, Margaret ought perhaps to be more sympathetic to the study of consciousness from the perspective of the one experiencing it, but her passion is looking outward, to the stars. 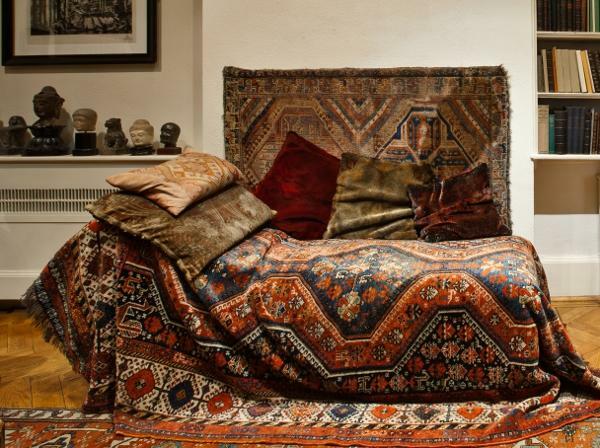 Freud’s consulting office in London is now a museum, preserved complete with the original couch and the great man’s collection of antiquities. The famous Freudian couch. It looks rather inviting. Vladimir Nabokov’s memoir of his youth in pre-revolutionary Russia is one of the most aesthetically stunning autobiographies I’ve ever read. He originally wanted to call it “Speak, Mnemosyne,” referring to the female Titan whose name means “Memory,” but his publisher vetoed that idea. To me it was significant that John gave Andy this book. Instead of trying to shape her taste as he did when they were first married, he acknowledged and valued what she loved. The first edition of “Speak, Memory” printed in 1951 in the UK. Well, this kouros, what can I say? Nice bod, shame about the face? I was quite moved by the letter and book that John left Andy. Her mother is s bit of a riot! Lol. The Archaic smile can be taken a bit too far. As for John, well, he’s still telling Andy what to do. But it was his way 🙂 I loved writing his conversation with Margaret! Thank you, Sylvie. I feel compelled to announce that she is NOT based on my mother, in case Mom reads this 🙂 She was inspired by the mother of one of my friends. I did not even know such women existed !